Tilar Mazzeo has distinguished herself both as a teacher and author of creative nonfiction works. She became fascinated by the Hotel Ritz in Paris (a.k.a. The Hotel) while reading declassified documents about the wartime activities of fashion designer Coco Chanel. The main focus of the book is on the period of time between 1941–1945, but the author traces the Hotel’s history from construction in the late 1800s to contemporary times. Dr. Mazzeo eschews the traditionally dry litany of facts used so often in historical accounts. 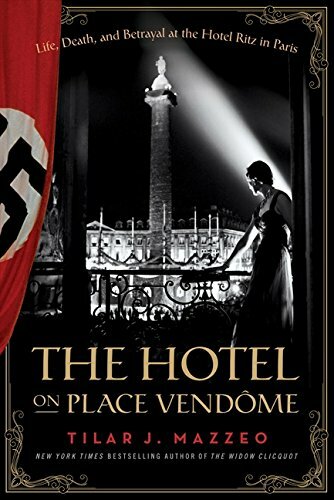 Using the Hotel Ritz as a lens, she presents the happenings of World War II in very human—and very memorable—terms. Each chapter is dense with dramatis personae and everyday incidents contributing to the story. Even with Paris under siege during World War I, dinner parties continued; the intrigues were endless. There was hunger throughout the capitol, but the Ritz was isolated—and indifferent. The stage was being set for the Treaty of Versailles, intended to shame and impoverish the Germans at the end of the war. The rise of Hitler and another world war were practically inevitable. German soldiers occupied a separate wing of the hotel during World War II. General Hermann Göring took up residence as Hitler’s aide de camp. Well-heeled expatriates, war correspondents, and French citizens all coexisted. As fortunes were lost a brisk trade in jewelry and furs between residents and the Nazis thrived. Coco Chanel amassed a fortune selling her signature Chanel No 5 fragrance to the Germans. (Picture Ms. Chanel descending into the hotel’s fur-carpeted bomb shelters with a retinue of maids, her gas mask on a pillow.) Truly one of the most colorful characters in this human drama, she is audacious about her many liaisons—with no regard for her partner’s passport. She was an equal opportunity opportunist. No group was spared their share of intrigue and betrayal. Competition for scoops among war correspondents superseded all manner of fair play, especially as the allied troops landed at Normandy. The author describes one man’s determination to get back to the front by entrusting his rolls of film (106 images) to a courier in London (only 11 survived). Wounded, he was back on the beaches the next morning. Ernest Hemingway, in competition with then-wife Martha Gellhorn “poached” her press credentials from Colliers. Undaunted, Martha boarded a medical rescue ship (still without credentials). “When the nurses landed onshore, Martha was among them. She joined the ambulance team and worked side by side with the other medics. Only later would she return to London to file with Collier’s as a freelancer. The magazine had too much sense not to publish them.” Yet in spite of whatever had gone before, these unlikely competitors found their way back to the Ritz as colleagues (and more). As allied troops made their way toward Paris, the grip of the German occupation began to unravel. As readers, we are witness to the paranoia of German troops after they learned of a foiled assassination attempt on Adolf Hitler in 1944. Here the chapters become less storylike and more factual, detailing the reaction of the Germans as well as their enemies. Resisters perished. Fragile alliances dissolved. Trust ceased to exist between comrades. Thousands were forced into trains headed for Buchenwald; relatively few returned after liberation. During the war years, millions of people disappeared, as did thousands of works of art. The Nazis made frantic attempts to destroy any evidence of their occupation. An entire chapter is devoted to the actual liberation of the city. Infighting as to which group should be the first to enter delayed matters endlessly at great human cost. The press corps was no exception. Their hunger for power and notoriety reveals the same self-serving behavior as the military leaders. Even after the liberation of Paris, the war dragged on; those liberating the concentration camps—including Martha Gellhorn—were changed forever by what they witnessed. To read this book is to study history from a very human vantage point—one that will reside in the mind long after specific data are forgotten. Mazzeo is a fascinating storyteller who stays true to her nonfiction pact with the reader. Her chapters are self-contained vignettes highlighting historical facts through the human players who shaped them. Extensive bibliographic notes document each chapter. The author deftly illustrates how these incidents shaped the future. Diane Brandley’s travel writing appears in newspapers and Going Places magazine.